(AP Photo/Brennan Linsley) Water flows through a series of sediment retention ponds built to reduce heavy metal and chemical contaminants from the Gold King Mine wastewater accident, in the spillway about 1/4 mile downstream from the mine, outside Silverton, Colo., Friday, Aug. 14, 2015. 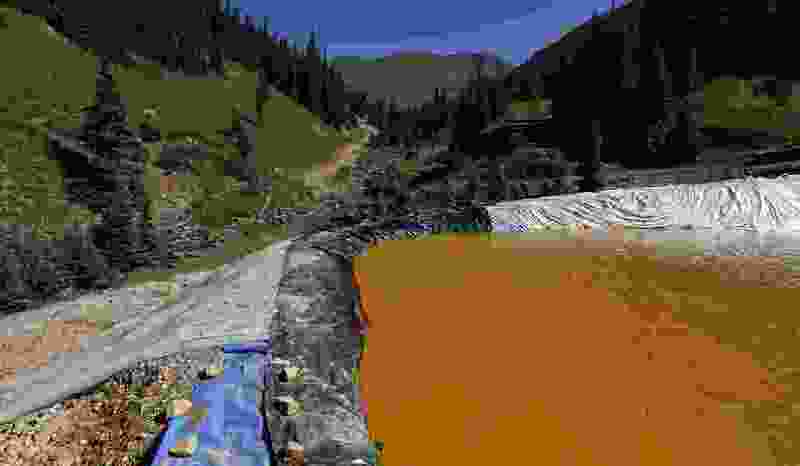 Officials have said that federal contractors accidentally released more than 3 million gallons of wastewater laden with heavy metals last week at the Gold King Mine near Silverton. The pollution flowed downstream to New Mexico and Utah. Utah has added the U.S. Environmental Protection Agency and a contractor as defendants in the state's lawsuit over a mine waste spill in Colorado that polluted rivers in three states. The Utah Attorney General's Office said Friday it's still negotiating with the EPA over damages from the spill but filed suit to preserve the state's legal rights. The state didn't explain why it added the contractor, Weston Solutions Inc. Neither the EPA nor Weston Solutions immediately responded to after-hours emails seeking comment. Utah sued mine owners and other contractors in August seeking unspecified compensation for the 2015 spill at the Gold King Mine. An EPA-led contractor crew inadvertently triggered the spill while excavating at the mine entrance. The spill tainted rivers in Colorado, New Mexico and Utah with heavy metals.